A distinguished painter, printmaker, and sculptor, Oliver Lee Jackson (b. 1935) has created a complex and original body of work that remains rooted in the human figure while drawing on all the resources of modernist abstraction and expression. Jackson's paintings, often large in scale, defy categorization. Figurative elements captivate the eye, while the dynamic compositions, vibrant colors, and vigorously worked surfaces in a variety of materials capture the viewer's attention. On view in the East Building of the National Gallery of Art, Oliver Lee Jackson: Recent Paintings presents some 20 paintings created over the past 15 years, many of which are being shown publicly for the first time. Oliver Lee Jackson's mastery of painting is evident in the works, which reflect his personal sensibility and ease with his materials. His compositions offer connections between gestural actions (pointing, kneeling), recurrent motifs (figures with hats, instruments, or carts), and references to the act of making (drawing, brushing, measuring). The exhibition also includes a film created by the Gallery featuring an interview with the artist in his Oakland studio. "Jackson's experience working with writers, musicians, dancers, and other visual artists directly inspires his colorful compositions. His work has captivated audiences worldwide and challenges viewers to see in new and different ways," said James P. Gorman, chairman and chief executive officer, Morgan Stanley. "At Morgan Stanley, we strive to challenge ourselves to discover new perspectives to share with our clients and communities, and we are pleased to be able to play a part in sharing Oliver Lee Jackson's work with you." "Unlike many artists who came of age in the wake of abstract expressionism, Jackson never abandoned his figurative orientation," said Harry Cooper, senior curator and head of modern art, National Gallery of Art, Washington. "Having worked with Jackson for over two decades (including on a 2002 exhibition at the Harvard Art Museums), I am excited that we are presenting his recent work, which for all its discipline has an extraordinary freedom and daring. The paintings presented here may be the fruit of Jackson's long experience but they have a youthful energy that recalls Ezra Pound's battle cry of modernism, 'Make it new.'" One of the most striking works in the exhibition is the large Triptych (2015), consisting almost entirely of colored felt cut and applied to board. In each panel, dark forms suggesting figures or parts of figures seem to move, dance, or run in and through fields of light blue, orange, pink, green, and white. Figurative references—looming heads and recumbent bodies—are also contained within the fields of color. 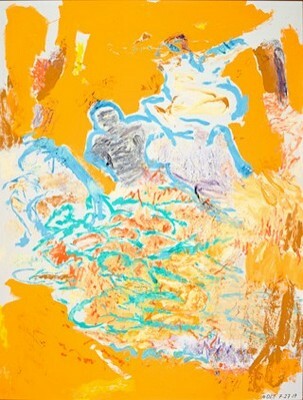 The imagery, with its simultaneous suggestions of joy and intense energy, dance and flight, echoes thematic material that has permeated Jackson's career, from the dynamism of his works of the 1970s inspired by newspaper photographs of the 1960 massacre in Sharpeville, South Africa, to persistent themes of a grand dance evoking a sense of spectacle and ritual. While collage and cut-outs have a long history in 20th-century art, Jackson's embrace of felt, which he values for its saturated color and optical neutrality, is distinctive. He folds and overlaps the cloth to create sensations of depth that complicate (without ever contradicting) the inherent flatness of the materials. Another highlight of the exhibition is a group of eight paintings from 2003 and 2010-2011, each just over five feet square, made with water-based pigments on canvas with touches of spray paint and gold and silver leaf. Once again, Jackson's unusual choice of materials at this scale (watercolors are usually confined to small works on paper) allows for striking and original effects. These works are notable in Jackson's oeuvre for their dramatic restraint and apparent simplicity. Some seem to be entirely abstract while others make clear references to birds, flowers, and figures. The paintings exhibit an improvisational daring that the medium of watercolor both allows and enforces. Born in 1935 in Saint Louis, Missouri, Oliver Lee Jackson collaborated on community cultural projects with composers and saxophonists, including Julius Hemphill, Oliver Lake, and Marty Ehrlich, and members of the cross-disciplinary collective Black Artists Group. Jackson served as assistant director of the People's Art Center (1963–1964) and as director of Program Uhuru (1967–1968), which he established at the Pruitt & Igoe public housing project to bring creative discipline to its youthful residents. He moved to California in 1971 and has lived and worked in Oakland since 1982. Jackson's paintings, prints, and sculptures have been the focus of solo exhibitions at the Contemporary Art Museum, Saint Louis; Carpenter Center for Visual Arts, Harvard University; and Seattle Art Museum, among others. Jackson's work has also been included in group exhibitions at museums including the Whitney Museum of American Art; Museum of Modern Art; Museum of Fine Arts, Boston; Museum of Contemporary Art, Chicago; San Francisco Museum of Modern Art; and the Los Angeles County Museum of Art. His work is included public and private collections across the United States, including the National Gallery of Art, Washington; Museum of Modern Art; Metropolitan Museum of Art; Yale University Art Gallery; Detroit Institute of the Arts; San Francisco Museum of Modern Art; and Fine Arts Museums of San Francisco. The exhibition is made possible through the generous support of the Robert and Mercedes Eichholz Foundation. Morgan Stanley is proud to sponsor Oliver Lee Jackson: Recent Paintings. Additional funding is provided by The Tower Project of the National Gallery of Art.